Espresso Coffee Club proposes an assortment of full compatible capsules for barkeeper(coffeepot) Nespresso ®. The compatible capsule Coffee Expresso Club allows the consumption of top-quality Espresso regarding intensity, regarding flavors and regarding complexity. Mixtures are created by using only the best arabicas and robustas. Capsules are hermetically sealed to guarantee a perfect freshness. 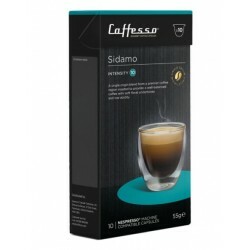 Sidamo Caffesso capsules compatible with Nespresso ® 100% arabica.Caffesso Sidamo (Intensity 10),This Sidamo capsule from Ethiopia pure arabica is a well balanced and deliciously fragrant coffee. Its low acidity and floral notes make it an excellent espresso. 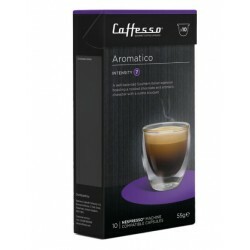 Caffesso Aromatico (Intensity 7) compatible Nespresso ® coffee pods Capsules made ​​a very balanced Arabica blend from Central America and South America for a very balanced and flavourful espresso. Intenso by Caffesso, Nespresso® compatible capsules. Intenso by Caffesso ( intensity 12) are Nespresso® compatible capsules made with a perfect blend of Ethiopian, Mexican, Indian and Columbian coffee beans. Caffesso Indiano 10 capsules compatible Nespresso ®. Compatible Nespresso pods composed Impresso ® Caffé intense aromas bringing an intoxicating flavor. This pack Caffesso allows you to discover the compatible capsules of this brand at the best price.This offer consists of 120 capsules, 20 capsules of 6 coffee references. Forza Roma by Caffesso, 60 Nespresso® compatible capsules. Forza Roma by Caffesso and compatible with Nespresso® coffee machines. This intensity 10 coffee is an espresso made of a blend of Arabica and Robusta offering a rich intense taste perfect for Cappuccinoes. Milano Caffesso, Nespresso® compatible capsules. Milano by Caffesso is a 9 intensity coffee compatible with Nespresso® coffee machines. The coffee is made of a perfect blend of Central and South American coffee and an intense Malabar Coast coffee. Caffesso Decafeinato (intensity 6) compatible Nespresso ® capsules. Pod-compatible 100% Arabica roasted slowly for a fruity and refreshing taste to taste at all times.